Jungle Jim is a natural enthusiast who likes to explore nature and discover new species. In this game, players are invited to tag along Jim as he goes through the dangerous Amazon forests in search for new species of insects and animals. 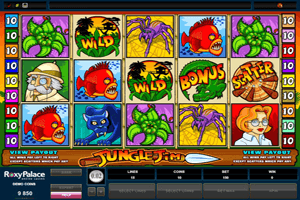 Microgaming creates the theme of the game and the jungle environment through the game’s visuals. This is why players will notice that the game’s reels are located inside the jungle. As for the symbols that will land on the 5 reels and the game’s 15 lines, they include a tiger, fish, a spider, Jim, Jim’s female associate, the wild jungle symbol, a dangerous flower, an old scientist, a cobra snake and the scatter hunting spears. Play Jungle Jim Slot here. The above mentioned symbols all come in high quality visuals that allow players to enjoy a visually entertaining experience. The game comes packed with plenty of winning chances including the line payouts and a couple of special symbols. Players can know more about the payouts as well as the bonus symbols at the paytable of the game. The first special symbol is the wild jungle icon that can replace other icons in order to help players in their quest of forming a winning combo to get paid. The scatter spears give out scatters rewards and the bonus crocodile can trigger the bonus round of the game, which consists of free spins that come with a multiplier.